Bout of Books 21 has ended but the fun doesn't stop until the Grand Prize Winner is announced! Myda's winning entry came from tweeting a message. 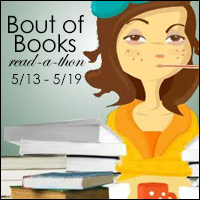 For those that are interested in helping out for the next Bout of Books, we post a call for help roughly a month prior to the start of the read-a-thon - which will be around April 16th for Bout of Books 22. Keep an eye on this blog for that announcement. Once again, thank you to everyone who helped make Bout of Books 21 a success! We appreciate that you love books and how vocal you are about sharing it! You have survived Bout of Books 21! Bout of Books 22 will be from May 14th to May 20th. Did you know? Book reviews help other readers discover new books. For today's challenge, we encourage you to write a review of a book you've read during the readathon (or recently) and publish it where other readers make their purchasing decisions (e.g., Amazon, Goodreads, etc.). Be sure to share it with us. Thanks to Make Kay for today's challenge. We all have our bookish favorites so why don't we share? Share with us! Here's a list to get you started. Answer as many or as few as you like. Thanks to the Minx for today's challenge. Thanks to Liz Whitehouse and Make Kay for today's challenge. Welcome to Bout of Books 21! For Bout of Books 21, all challenges will be hosted on the Bout of Books blog. Here. Right here. So keep your eyes on this site to see what's what for the day!